Some of these remarkable homes look like little more than a grassy hill—until you get inside. Plumb the depths of houses that sit largely underground. The entryways and windows are up top. 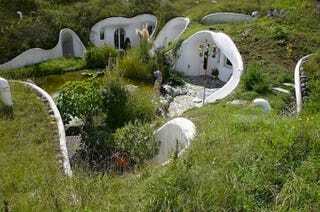 You can see more Hobbit-influenced houses here. This two-story building, designed by architect William Morgan, was built into the Atlantic beach sand dunes in 1975. It's for sale, you can buy it for a mere $1.4 million. Accessed through a shed or cave on the site of the unremarkable vacant lot above it, 3970 Spencer boasts all the comforts of suburban life in Las Vegas, circa the late 1960s: A heated pool (with a water fountain), a four-hole putting course, jacuzzis, a bar, and a dance floor. Then there are more unusual features, like the sky control system—a dimmer that can be set to "morning," "dusk," or "night," which activates the "stars" embedded in the ceiling. Just above them, a thick concrete shell protects this perfect suburban simulacra from impending nuclear doom. The home was built in the mid-70s by one Girard B. “Jerry” Henderson, an entrepreneur whose company, Underground World Home Inc., specialized in luxury bunkers. Henderson wasn't always a paranoid homebuilder. Born in Brooklyn in 1905, he climbed rose through the corporate ladder to become director of Avon and found his own education charity. Underground living was more of a hobby, until the Cold War—and demand for bunker homes boomed. Decommissioned in 1965, now it's a 2,000-square-feet (185 sam) luxury home that could withstand a nuclear attack. Do you like awesome underground bunkers? Find more secret underground bunkers here. This Atlas E ICBM site was bought by Edward Peden and his wife in the 1980s at a really decent price. Since then, they've renovated the whole some and now have 6,500 sq ft (603 sam) of living space and 11,000 sq ft (1020 sam) of underground garage or shop. The plans for the 8,000 sq ft (743 sqm) five-bedroom, grass covered house with photovoltaic panels and a wind turbine were approved by a famous client, the football star Gary Neville in 2009, but in December 2012 he was forced to ditch them, according to Daily Mail. It was constructed in the early 1970s and built by more than 300,000 locals who mostly dug by hand. Within the city were stores, restaurants, schools, theaters, barbershops, and even a roller skating rink. The underground city also featured over 1,000 air raid shelters, and it was built to house up to forty percent of the Beijing’s population in the event of an attack. – according to Listverse. A little bit of the complex system was opened as a museum in 2000, but closed in 2008 for renovation. Some people are actually living here, 26-59 ft (8-18 m) under the surface.